Baby, it’s getting cold outside, and with that comes a heavy dose of the unexpected. Whether it’s an overnight whiteout or a sudden drop in temperature that leaves your driveway looking like an ice rink, Old Man Winter can be downright unforgiving to you and your vehicle. Nowadays, there are few places protected from his wrath; last year’s polar vortex, which hit places like subtropical Florida, proved that. Be ready for the chaos he brings by checking out this guide on how to deal with treacherous winter situations should you encounter one while on the road. 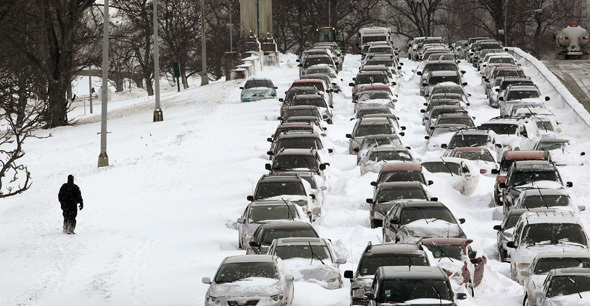 In February 2011, many Chicagoans left work thinking they would make it home before the full force of a forecasted winter storm would hit. Instead, they were pummeled by 70-mile-an-hour winds and buckets of snow, famously stranding many along Lake Shore Drive. Think that could only happen in the frigid Midwest or in places like Buffalo, where that crazy lake-effect storm dumped more than five feet of snow? Guess again: Early in 2014, a wet winter storm left thousands of drivers stranded in Atlanta. Be prepared for such an emergency by packing a kit for your vehicle, full of warm blankets, water, food and roadside assistance tools, like tire chains and flares. Also, be sure to keep your phone charged to stay connected with loved ones, authorities and roadside assistance. For roadside assistance, have your Vehicle Identification Number (VIN), license plate as well as make and model ready when placing the call. You’ve been snowed-in for days, watching the same cartoons over and over with your kids and listening to your in-laws talk about their bingo tournaments in Florida. The snow has let up some, so you decide it’s a chance to escape for a drive down to the corner store. Bad idea. You hit a slick patch of ice on the way and swerve into a bank. To get out, don’t spin your tires, which will dig your vehicle deeper into the snow, but instead put the car in its lowest gear and try to back out slowly. If that doesn’t work and you have a bag of cat litter handy (a good idea to pack beforehand), sprinkle it below the tires for traction and try again. The snow has unexpectedly started up again on your drive to work, covering your windshield in a soup of slush and ice chunks. Road salt and the plows ahead of you aren’t helping, either. You turn the windshield wipers on but unfortunately for you, they do little to cut through the wintery gunk, hindering your line of sight. Stay ahead of the situation by checking your visibility before you hit the road. Do this by testing your head and rear lights, windshield wipers (are they streaking?) and washer fluid. It’s a good idea to keep extra washer fluid stowed in your vehicle, just in case a retail store is not readily available. Lumps of coal in a holiday stocking aren’t the only rude awakenings one can get during the winter season. Snow and water can obscure potholes in the road, creating traps for drivers who don’t pay close attention. Watch for puddles and pockets of snow and reduce your speed on rough roads to protect your vehicle from damage. If you do hit a pothole, don’t slam on the brakes—it puts extra stress on your car’s front suspension. History has shown that cold waves can strike all parts of the country, whether you live in Cincinnati (home of the infamous “Freezer Bowl” in 1982) or even hot-weathered cities like Dallas (record snowfall in 2013). Sometimes, a cold spell can sneak in while you’re sleeping, catching you, as well as your vehicle, off guard in the morning. In general, as the temperature drops, engines are more difficult to start and batteries lose their power. Keep a spare pair of jumper cables handy just in case this happens to you, as well as a charged jump box should a trusted neighbor be unable to help. Better yet, ensure your car battery can stand up to winter by choosing the right one. You’re going on a quiet winter drive past a nearby lake, thinking that there’s no immediate danger because the skies are clear and no snow is on the ground. Little do you realize that pockets of black ice, glossy and clear, lay there instead. Stay aware by learning when and where black ice is likely to form. It most commonly occurs when light rain falls on a road that’s cooler than 32 degrees or when roads are wet and the temperature plummets toward freezing. Roadways open to moisture and circulating cool air, like those by bodies of water or on bridges and overpasses, are especially susceptible to it. So monitor the outside temperature through your instrument panel, avoid using cruise control, and if you do end up hitting a patch, don’t panic or hit the brakes; if possible, gently steer in the same direction as you’re gliding. What’s that? The mountain-size piles of snow outside are finally gone? And the roads are actually safe to drive on? Huzzah! You’re not out of the woods yet, though. Salt residue can cause rust and corrosion to the underbelly of your car, so make sure to spray it with a high-pressure sprayer or get it washed soon. Clean your headlamps for visibility and make sure they are properly aligned. Also, it’s important to check your vehicle’s vitals after winter, whether it’s the battery, the brake pads or the wipers. All this can be checked as part of your vehicle check up.